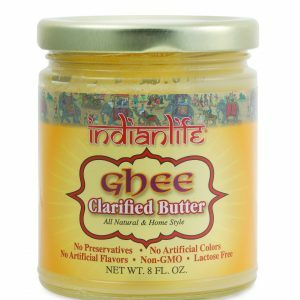 Ghee | IndianLife Foods Inc.
Ghee (or clarified butter), is one of Ayurveda’s most powerful “ancient allies”. Rich in important medium-chain fatty acids, this Indian cooking staple is considered one of the healthiest cooking fats. Our all natural, home-style Ghee is made fresh from pure Grade AA butter. 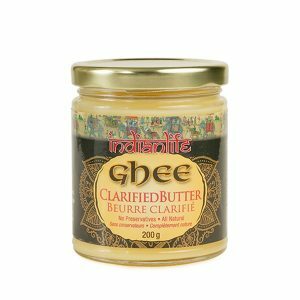 Ghee is often tolerated by those with dairy intolerance, and can substitute for oil or butter in virtually any recipe. In addition it’s rich in compounds believed to fight inflammation. Every cooking fat has a smoke point. The higher the smoke point, the more uses it has. 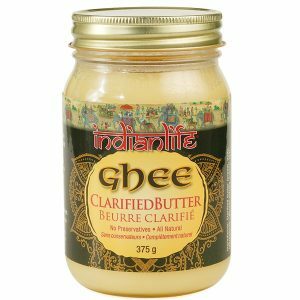 Ghee has a higher “smoke point” than coconut oil, which also makes it ideal for sautéing and frying.